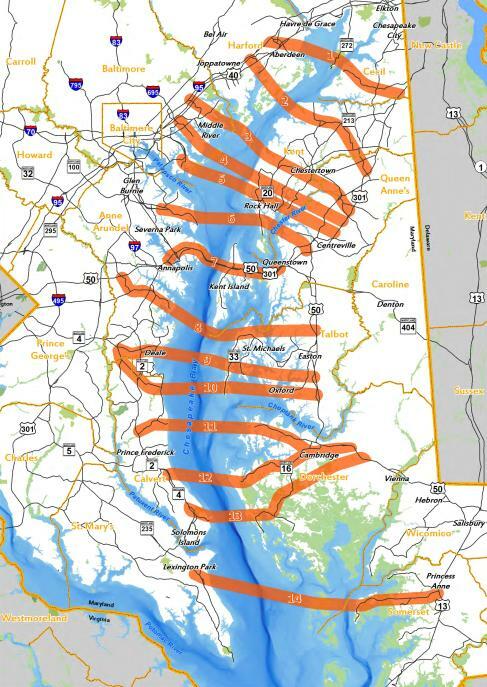 Maryland Transportation Authority and the Federal Highway Administration have produced a series of draft maps showing the locations of all 14 possible routes in relation to features such as county boundaries (see below), different types of land use and areas of floodplain or wetlands. The maps were made public by local politician Robin Grammer, who represents a district containing two of the potential routes. A new crossing is needed to address congestion at the Chesapeake Bay Bridge, which is officially called the Governor William Preston Lane Jr Memorial Bridge. A US$5 million study is under way to identify a preferred corridor and evaluate the project's financial feasibility. The study began in 2015 (link opens in new tab).